Our forests have been devastated this past summer and the animals are suffering too! A smoldering time bomb burns, silently. It hasn’t rained in 45 days. The land craves moisture, a drink of morning dew or spray of evening mist, anything to soothe the cracked soil. Hot winds whistle through the dry canyon sparking the burning embers into life. A tiny flame flickers as the straw-colored grass ignites blade by blade until a red line of fire snakes its way along the canyon walls. Urged on by the wind it quickly spreads, leaving a blackened trail in its wake. A wall of gray smoke fills the gorge, choking everything in its path. The flames raises its voice in a ferocious roar as it closes in on the wooded valley. The sweet smell of burning grass precedes the flames. The fire crackles and spits sparks on its path of destruction. Flames burst forth, scorching the sacred earth. Moles and mice dig deeper into their burrows hoping to sit out the fire in the safety of their dens. The fire’s heat urges snakes deeper into the canyon walls. Several birds veer off silently, fleeing the smoke and flames. Those that remain behind, trying to protect their young, succumb. The smell of burning feathers blends with the pine pitch as the fire rages on into the forest, lighting the tall pines like torches. The animals scatter throughout the timber. A mother possum waddles along, her babes clinging to her back, as the smoke swirls through their forest home. Squirrels spring from branch to branch searching for escape but find only fear. Their eyes burn and with each terror-filled breath the smoke scorches their lungs. Raccoon mothers, trundle along the forest trails, toting their young in their mouths. Though some kits will survive, others will perish in their tree and root dens. 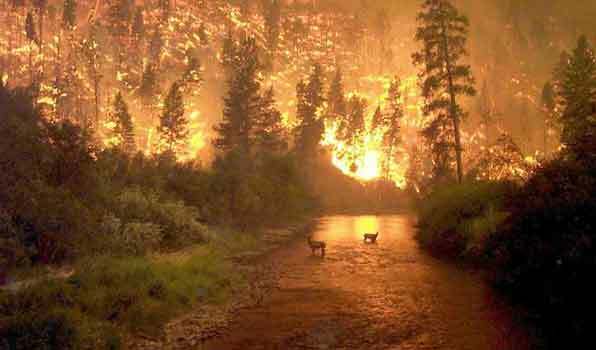 Deer and coyotes run side-by-side, no longer predator and prey, as they flee for freedom from the raging inferno. Bear cubs wail in fright from treetops, as their mother lies dead on the forest floor. A spark ignites the pine tar and they are soon engulfed in flames. Nature mourns, enwrapped in the aroma of burning fur. The winds howl as the fire flicks its tongue higher and higher into the treetops. The drone of water-bombers filters through the fire’s roar, red retardant extinguishes the orange flames leaving behind a smoky vapor. The fresh scent of pine and cedar gives way to the smell of burnt wood and steam. On the ground, trained fire fighters work endlessly back burning and clearing the underbrush and trees to establish firewalls. Weary workers reeking of sweat and smoke stomp on smoldering cinders, which they rake up with blackened tools of the trade. A water bearer walks the line offering bottled water. The cool liquid lubricates dry aching throats, but does nothing for the tired bodies. A young boy squats besides the charred remains of a fawn, his tear-stained face echoing the horror he sees through bloodshot eyes. Orders are passed down. Re-line, move on, there are more fires to start, more firebreaks to cut before dark. Back at headquarters the Incident Commander briefs a new round of recruits, then issues a media update to the waiting television crew. Fifty thousand hectares are still burning with no end in sight. They pray for rain, or a change in the winds. Two volunteer firefighters, suffering from exhaustion and smoke inhalation have been airlifted to the nearest hospital. Cause of fire? A carelessly tossed cigarette! Sunset, and the sky is ablaze! Its beauty is magnified in the clouds by the polluted, pink smoke. The air is heavy with smoke, sweat and burning timber. The battle between the water-bombers and tree torches continues. The ground crew gathers their equipment in preparation for a night of rest. Bent and weary bodies slowly emerge from the smoke and board the waiting truck. An army cot and a hot meal await them in a school gymnasium somewhere down the road. Tomorrow they will head out with aching muscles and scarred souls to fight fire with fire once again.